With what seems like inescapable, up-to-the-minute coverage of dropped call banter swirling around a tech universe with Apple as the sun, you almost forget that other brands exist. The most recent angle on their reception debacle has been the “But they’re doing it too!” defense, Steve Jobs’ attempt at dragging down his competition in the same sinking ship of arrogant excuses by releasing comparative antenna results of other smartphone brands. The photos depict users gripping a variety of phones like rigor mortis has set in and insinuate that Apples loyalists holding their iPhones like hulking gorillas manhandling a plantain are the real problem. Samsung is combating Apple’s gorilla grip defense with a gorilla campaign of their own: free Galaxy S phones. 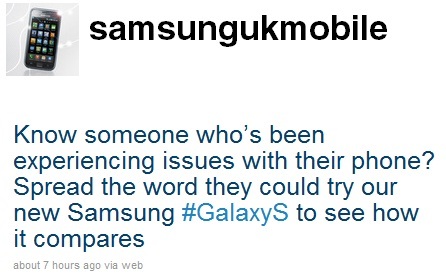 Users in the UK who recently escaped to their Twitter accounts to express their frustration with dropped calls on the iPhone 4 were met with responses from @samsungukmobile , telling them to reply with their contact information and they would receive a free cell phone. Responding to a stranger’s advances online usually makes you a target for a missing persons headline on the evening news; Tiffany Nieuwland wasn’t afraid. She spoke with Wired UK: [INDENT]"So I did what anyone else would do: I vented my frustration on Twitter. Imagine my surprise, then, when this morning I am tweeted by Samsung offering me a free Galaxy S, their latest phone. Too good to be true? I decided to investigate.” "I called a friend at Samsung, and though she was initially sceptical [sic], it has now been confirmed: the campaign is legit. Samsung is so confident about the superiority of the Galaxy S that they’re sending free ones to existing iPhone customers so they can decide for themselves. "[/INDENT] And just like that, as the result of an unconventional viral marketing campaign, Tiffany owned a brand new phone: the sleek and lightweight Samsung Galaxy S, the latest line of Android 2.1 phones released by Samsung housing Android 2.2 capabilities upon its eventual release. Boasting the fastest processor out of any available Android phone—its 1GHz Hummingbird chip outperformed the current generations fastest Snapdragon in the Nexus One by 3x—the Galaxy S is a handheld NASA computer she will most likely use to text “lol” to her friends really fast. A 4” Super AMOLED high-res widescreen display, 8 or 16 GB hard drives (expandable to 32GB via the microSD slot), and a 5x megapixel camera with 720p HD video, are accompanied by TouchWiz 3.0 technology. With the intuitive click-and-drag user interface that TouchWiz offers, users suffering from iPhone withdrawals will be able to easily wean away from their iOS (Apple’s mobile operating system) touchscreen past and on to greener pastures. 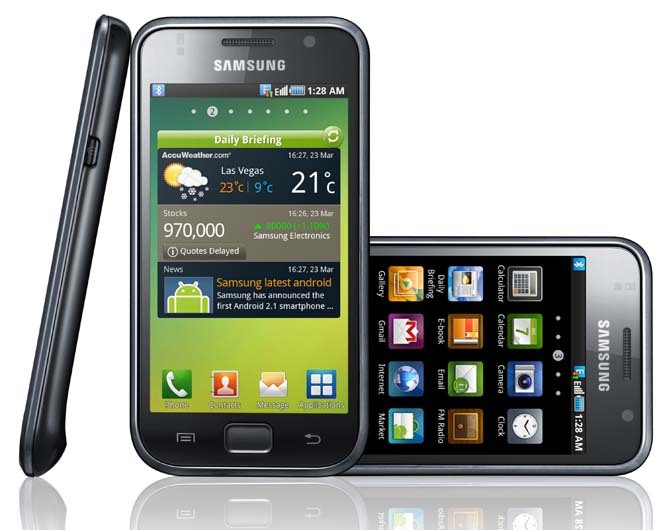 The Galaxy S line will also be the first smartphones offering support for Smart Life, Samsung's Twitter user interface. The one pitfall amongst all these pros? No camera flash. Current US models include the Vibrant on T-Mobile and the Captivate on AT&T and are currently available nationwide for $199.99.